The Find Sound Clips dialog box allows you to search through your project's audio tracks for its sound clips. You can search using the full name or part of the name of a sound clip, including its extension. You can iterate through the sound clips that match your search string, or simultaneously select all matching sound clips. When iterating through matching sound clips, it cycles through audio tracks vertically, from top to bottom, then from left to right. For example, if three matching sound clips are cued at the same time and a fourth one is cued much later, it will go through the matching sound clips that are cued at the same time first, from the top one to the bottom one, then to the clip cued later. In the top menu, select Clips > Find Sound Clips. Right-click anywhere in one of your project's audio tracks, then select Find Sound Clips. The Find Sound Clips dialog box appears. Search The search string to use for finding sound clips. Clips will match if part or all of their clip name matches the search string. If checked, sound clips will only match the search string if their name is in the same case as the search string. For example, the search strings "sound clip" or "SOUND CLIP" would only match a clip named "Sound Clip.wav" if the Case Sensitive option is unchecked. If it is checked, only the search string "Sound Clip" would match with that clip name. By default, when clicking on the Previous or Next button, the Timeline view will only scroll horizontally to the position of the sound clip it finds. If this option is selected, the Timeline view will also scroll vertically to display the matching sound clip. If your project has a lot of audio tracks and the Timeline view in your workspace hasn't been expanded to display them all at the same time, you might need to scroll up or down to find a matching sound clip, since the matching sound clip might be in an audio track that is not currently visible. Simultaneously select all the sound clips that match the search criteria, without moving the timeline playhead or scrolling the Timeline view. 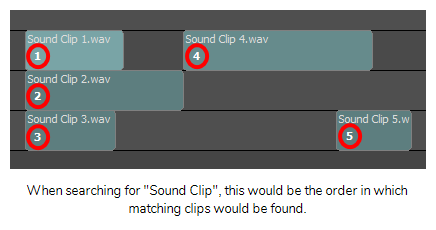 Search for a matching sound clip before the starting search position. If a sound clip is found, the Timeline view will scroll to the sound clip, it will become selected, and the timeline playhead will be moved to the beginning of the sound clip. NOTE If no sound clip is selected, it will start searching from the position of the timeline playhead. If a sound clip is selected, it will start searching from the position of that sound clip. Search for a matching sound clip after the starting search position. If a sound clip is found, the Timeline view will scroll to the sound clip, it will become selected, and the timeline playhead will be moved to the beginning of the sound clip. Close Close the dialog box.